Another positive session for the Baltic Dry Index saw the dry bulk industry?s main tracking index rising by 32 points to end at 821 points. Another positive session for the Baltic Dry Index saw the dry bulk industry"s main tracking index rising by 32 points to end at 821 points. Another positive session for the Baltic Dry Index (BDI) marked by the renewed Chinese iron ore interest saw the dry bulk industry"s main tracking index rising by 32 points to end at 821 points. Almost exclusively, this can be attributed at the capesize sector, which rose by 112 points at 1564. As a result, the Baltic Exchange"s average time charter rose at $11037, up by $1181 from the previous day. All other segments of the market were virtually unchanged, posting marginal losses of 1-2 points. 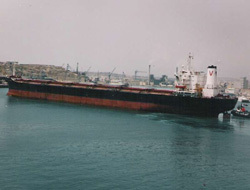 The Panamax Index fell by one point at 532 points, the Supramax Index stood at 389 points, also down by one point, while the Handysize index was down by 2 points at 270. The average time charter for panamaxes ended the session at $4235, supramaxes were at $4065, while handysizes fell the most at $3967. In line with the market"s behavior, Fearnley"s recent weekly report said, commenting on the capesize segment that ?the first real work week after the new year started with renewed vigor. Increased activity in the Far East was matched with Vale starting the year by taking 4-5 Capers in the first week for front haul cargos. We can now see a definite tightness of supply in the Atlantic, especially for cargos with January cancelling dates. In the Pacific the week/s early rally lost stem, but the majors have continued to fix vessels quietly, reducing the number of available vessels and increasing the congestion at Australian load ports, notable Newcastle is still having problems expediting vessels. With so much tonnage having been positioned in the east, the rate difference between the two basins is now narrowing, although a Pacific round voyage is still >30% higher than in the Atlantic?. But a different picture is painted for the panamax market, where there"s been continuously very slow activity all over. According to Fearnley"s there were some more spot cargoes in the Atlantic, ?however at marginal increase (round is about usd 5,000), except via USGulf where levels are now at usd 8,500 for trips to FEast. The worst market is in FEast where Pacific rounds fixed barely usd 2,000 and trips back to the Continent fixed 1,500/1,700 level. There has been some period activity and good vessels for 1 year obtain about usd 11,500 in Pacific and usd 12,500 in Atlantic?.